Performance of one or more steps of a patented method outside the United States negates infringement even if the foreign steps are performed under the direction and control of a domestic accused infringer. "[Plaintiff] argues that [defendant] 'is liable under § 271(a) under a joint infringement theory when it performs one step of the claims and directs it [sic] Costa Rican subsidiary to perform the remaining steps on its behalf.' Theories of joint infringement are cognizable under § 271(a) where multiple actors are involved, and the patentee can show that one party 'control[s] or direct[s] each step of the patented process,' even if some steps are 'performed' by others. . . . However, the 'joint' aspect does not eliminate the need to show all steps or stages of the claimed process are performed in the United States. The theory of joint infringement concerns who performed the steps of a claim, not where the steps were performed." Defendants' invalidity contentions were stricken with leave to refile. "The defendants’ almost 800 pages of 'Invalidity Contentions' do not put the plaintiffs on real or useful notice. The defendants’ current 'Invalidity Contentions' are an attempt to end run the rules. They do not specifically identify combinations of references that the defendants anticipate using at trial, and they include language purporting to make the contentions merely illustrative." Plaintiff's motion to require defendant's compliance with the claim construction deadline was granted. "Like many litigants, but unlike this Court, [defendant] seems to believe that a request for adjournment, if only it can be filed sufficiently belatedly, somehow is self-granting, as [defendant] proceeded to act as if its defective presentation of a discovery dispute excused it from serving the claims construction report that it was obligated to serve under the Court's orders. . . . This behavior will not be tolerated. [Plaintiff] is hereby ordered to serve its claim construction document . . . [in three days] on pain of sanctions." Defendant's motion for a stay pending ex parte reexamination was denied. "No Defendant in this case has taken advantage of Congress’s hard work in offering th[e] option [of inter partes reexamination]. Rather, one Defendant has reached back in history to the non-binding 'no risk for me' ex parte reexamination process, allowing all Defendant to lay behind the log, hoping for favorable developments with the passage of time. Instead of streamlining the process, Defendants’ choice guarantees the imposition of additional costs on [plaintiff], and indicates a lack of desire to resolve the issues in the case in a timely manner." Plaintiff waived any privilege regarding documents flagged by defense counsel during an inspection of documents at plaintiff's corporate offices. Although plaintiff claimed that "defense counsel ignored express instructions and improperly inspected . . . documents which were located in a cabinet which had not been made available for inspection," but which was located in a room to which defense counsel was granted access, the court determined that plaintiff failed to exercise "reasonable precautions to prevent inadvertent disclosure," and failed to object until after the documents had been copied by a third party vendor. Defendant was permitted to amend its answer to include a claim for inequitable conduct. "Although [plaintiff] maintains that [defendant] possessed the documents which form the basis of its inequitable conduct pleadings for more than a year, in light of the 'pleading with particularity requirement of Rule 9(b),' it was appropriate for [defendant] to confirm the factual allegations through discovery." "Key to the court’s decision are the facts that no [accused products] have been sold in Texas; no act of infringement has been identified as occurring in the Eastern District; only one potential witness has been identified as having any connection to Texas at all; multiple potential witnesses are located in or near the Southern District of New York . . .; and both parties have their principal places of business in the Southern District [of New York]. Although other witnesses and evidence may be located outside of New York, [plaintiff] fails to specifically identify any such individuals or documents to the court." Defense counsel was sanctioned for "materially misquoting Rule 33(d) of the Federal Rules of Civil Procedure in arguing an incorrect application of the rule." "[Defense counsel] replaced the actual requirement of 'and if the burden of deriving or ascertaining the answer will be substantially the same for either party' (a standard [defendant] could not meet) with 'and answering the question would require the responding party to engage in burdensome or expensive research' (a standard which [defendant] could meet)." Sanctions consisted of "mandatory CLE classes on the Federal Rules of Civil Procedure and on Ethics, including the duty of candor to the court." Plaintiff's amended infringement contentions failed to comply with Local Patent Rule 3-1. Under Patent Rule 3-1, plaintiff’s claim chart must refer to "a single structure, process, algorithm, feature or function of any accused product." Instead, plaintiff's chart referred to multiple steps and multiple functions. "In Example 1 of [plaintiff's] claim chart, there are at least two steps disclosed . . . in Example 2, [plaintiff] groups multiple elements together and makes reference to an exhibit that consists of several pages of material. . . . Grouping two elements together and referencing a seven-page source code does not clarify where the elements are allegedly located." 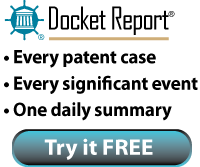 In granting plaintiff's motion to compel licensing documents, the court also ordered that "[defendant] is precluded from having its experts offer the opinion that the plaintiff’s proposed royalty or damages calculations are multiple times larger than what [defendant] has ever paid for software licenses in the past. [Defendant] has resisted producing all of its licenses and settlement agreements, and the plaintiff has no way to challenge this assertion." In granting defendant's motion to stay pending reexamination, the court rejected plaintiff's argument that "the benefits that [defendant] claims will result from the stay will be realized only if [defendant] agrees not to assert invalidity before this court if the PTO should find that the [patent-in-suit] is valid." "If the patent does not emerge intact from the reexamination, the chances of wasted effort on our part and that of the parties is substantial. Conversely, though the PTO’s treatment of the various issues raised may not be dispositive if the patent remains unchanged, it is highly unlikely that they will not be relevant and therefore helpful to the parties and this court in reaching final resolution of the infringement allegations." In the first case, Magistrate Judge Love determined the relevant public and private factors did not warrant a transfer of venue. "[Because] only two factors weigh slightly in favor of transfer -- the convenience of witnesses, and the potential need for compulsory process with regard to three nonparty witnesses -- all other factors are neutral . . . Defendant has failed to show that transfer to the District of Maryland would be clearly more convenient." In the second case, Magistrate Judge Love granted a transfer because "a Maryland court has had extensive involvement with three of the six patents at issue and a settlement agreement was entered into in the Maryland litigation that forms the basis of Defendant’s patent exhaustion defense. Based on this analysis, the Court finds that Defendant has shown that transfer to the District of Maryland would be clearly more convenient." Defendant's motion to amend its answer to include inequitable conduct was denied. "As this court has explained before, a party does not show good cause for an untimely amendment simply by arguing that the other party was slow in providing discovery. . . [and] prejudice to plaintiff is almost certain because the deadline for filing a motion for summary judgment has passed, which means that plaintiff would be unable to obtain a ruling on this issue before trial." "The Court finds that, under the current state of the law, the scope of section 271(b) can extend to extra-territorial activities. Because [plaintiff] has alleged that [defendant] sold potentially infringing modules to foreign companies knowing that those modules would be incorporated into products sold in the United States, [plaintiff] is entitled to discovery regarding [defendant's] extraterritorial activities." The court denied Dell's motion for a permanent injunction and "preliminarily" set an ongoing royalty of $4 per infringing unit. The court also rejected the notion of an annual flat-rate royalty. "Both sides’ briefing concerning a reasonable ongoing royalty rate fails to base suggested rates on actual economic analysis or evidence adduced at trial. . . . Any yearly flat-rate royalty amount is unreasonable and is rejected." The parties were ordered to confer concerning the "preliminary" per-unit royalty and to file objections if an agreement could not be reached. Stay pending inter partes reexamination was denied because (i) defendant's "product [the [the "XIENCE V stent"] directly competes with [plaintiff's] product [the the CYPHER drug-eluting stent] and has caused a significant decline in [plainiff's] market share, (ii) "a stay will not necessarily simplify the issues because the reexamination may not cancel all of the 70 asserted claims," and (iii) "both parties have already completed substantial discovery and could presumably begin a trial [within a year]." The court denied defendant's motion to transfer venue from the Eastern District of Texas to the Eastern District of North Carolina, noting (i) "the Eastern District of Texas is a centrally located venue . . . [t]he sources of proof in this case are many and are spread across the nation. . . . [w]hile transfer to North Carolina would make access to some proof easier, this Court is not convinced that access to all evidence would be so," (ii) "a transfer from one district without absolute subpoena power to another without absolute subpoena power is not clearly more convenient—such a transfer will merely reallocate inconvenience to the transferee district," (iii) "the central location of the Eastern District of Texas in relation to this nationwide suit makes it, at the very least, as convenient a location as North Carolina," and (iv) "[b]ecause this case is nationwide in scope, each factor is either neutral or does not weigh in favor of transfer . . . [a]s such, Defendants have not clearly demonstrated that transfer is appropriate." The court reduced the amount of sanctions awarded for repeated discovery misconduct by eight percent (from $42,923.75 to $39,489.85) because plaintiff's counsel billed time in quarter-hour increments. "The Court finds that quarter hours inherently enhance the amount of fees and do not reflect the hours reasonably worked, compared to one-tenth hour increments." Classified Cosmetics v. Del Laboratories Inc., 2-03-cv-04818 (CACD January 28, 2009, Minutes). "The Court finds that the overall nature of this case, considering all of the involved parties, is regional and would therefore be more conveniently handled by the Northern District of California." Plaintiff's first-filed patent infringement claim did not permit plaintiff to amend its complaint to seek a declaratory judgment concerning defendant's business torts claims that were previously filed in Missouri.